Visual Studio Code>Programming Languages>MSBuild project toolsNew to Visual Studio Code? Get it now. Tools for working with MSBuild project files (such as auto-complete for package Ids / versions). An extension for VS Code that provides intellisense for MSBuild project files, including auto-complete for <PackageReference> elements. 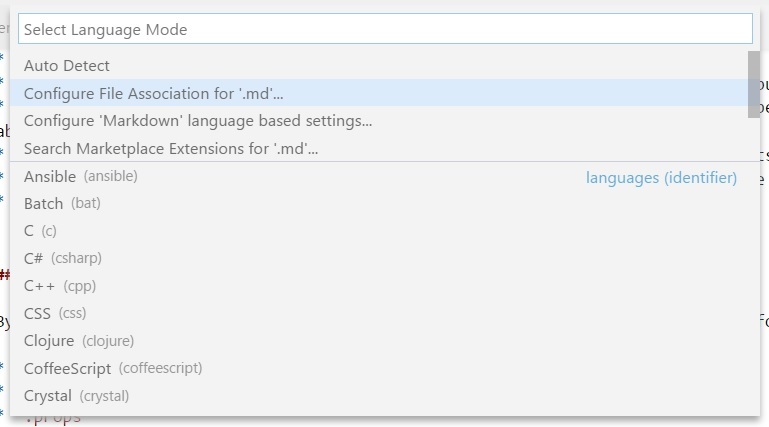 Note: there are features in the extension (marked "language service feature" below) that use an out-of-process language service; this is enabled by default but if all you want is PackageReference completion, you can disable the language service by setting msbuildProjectTools.language.enable to false in your VSCode preferences. You will need to reload VSCode after changing this setting. You need .NET Core 2.0.0 or newer installed to use the language service (but your projects can target any version you have installed). Completions for PackageReference and DotNetCliToolReference. Completions for Include and Version attributes of these items (invoke the NuGet: toggle pre-release command to include / exclude pre-release packages / package versions). Language service feature: Completions to create these elements. Language service feature: Completions for common top-level elements (e.g. PropertyGroup, ItemGroup, Target). Language service feature: Completions for import elements. Language service feature: Completions for property elements. Language service feature: Completions for item elements. Language service feature: Completions for common item attributes. Language service feature: Completions for common property Condition attributes. Language service feature: Hover the mouse over imports, targets, items, properties, and conditions to see information about them. Language service feature: Document symbols are supported for imports, targets, items, and properties. Language service feature: Go-to-definition is implemented for both SDK-style and regular project imports. Basic syntax highlighting of MSBuild expressions in attribute values. To see this highlighting, change the editor language from XML to MSBuild. Language service feature: Completions for $() property, @() item, and %() item metadata expressions. To enable these completions, ensure that the editor language is MSBuild (not XML). Language service feature: Completions for task elements and attributes based on metadata for tasks declared in the project and its imported projects. To enable these completions, add the string Tasks to the msbuildProjectTools.language.completionsFromProject setting. Useful snippets for common elements of MSBuild project XML (added by @doggy8088). To use these snippets, ensure that the editor language is MSBuild (not XML). Change the language mode by pressing Ctrl-Shift-P (or Cmd-Shift-P on Mac) and choosing "Change Language Mode". You can install this extension from the VS marketplace, or simply download the VSIX package for the latest release and install it by choosing "Install from VSIX" from the menu on the top right of the extensions panel. See architectural overview for details (this is a work-in-progress; if you have questions, feel free to create an issue). The VS Code extension API has changed somewhat since this extension was first created, and some features (such as hyperlinks to files in hover tooltips) are only partially functional at present (broken by VS Code API / behaviour changes). Limited intellisense is available for dynamic PropertyGroup / ItemGroup declarations (i.e. those appearing inside a Target element); these are only evaluated when the project is built and so very little information about them is available to us when statically evaluating the project (see tintoy/msbuild-project-tools-server#5 for details). Support for task completions is experimental; if you find a problem with it, please create an issue. If you open more than one project at a time (or navigate to imported projects), subsequent projects will be loaded into the same MSBuild project collection as the first project. Once you have closed the last project file, the next project file you open will become the master project. The master project will become selectable in a later release. If you have questions, feedback, feature requests, or would like to report a bug, please feel free to reach out by creating an issue. When reporting a bug, please try to include as much information as possible about what you were doing at the time, what you expected to happen, and what actually happened.